Gaibandha, Sep 1 (Just News): Six people including a child were killed and 10 others injured in a collision between a bus and a tractor-trolley in Mahadipur Rice Mills area on Gaibandha-Palashbari road under Palashbari of Gaibandha early Saturday. 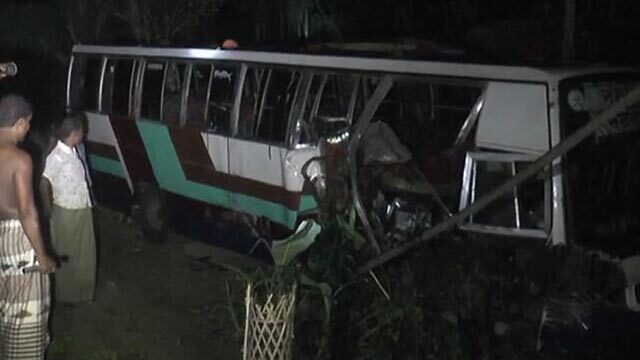 Police said the accident occurred when a Dhaka-bound passengers bus collided head-on with a trolley, locally known as ‘kakra’ of Habib-Hakim Food, coming from opposite direction in the area around 12:15am, leaving four persons dead on the spot and injuring 12 others. Being informed, police and firefighters here rescued the injured and sent them to Palashbari Upazila Health Complex. A child and a person succumbed to their injuries on way to the hospital. Of the wounded, two were sent to Rangpur Medical College Hospital in critical condition. The drivers and their assistants of the vehicles fled the scene, police sources said. The identity of the deceased and the injured could not be known immediately but Salma Khatun, a passenger of the bus, said the passengers were the inhabitants of Shaghata, Sadullapur and Sadar upazilas of the district. Officer-in-charge of Palashbari thana Mostafizar Rahman said the bodies of the victims were kept at Gobindaganj Highway Thana and the ill-fated bus and the trolley were also seized.